Rough Canyon is located in the BLM Bangs Canyon Management Area south of Grand Junction, Colorado. 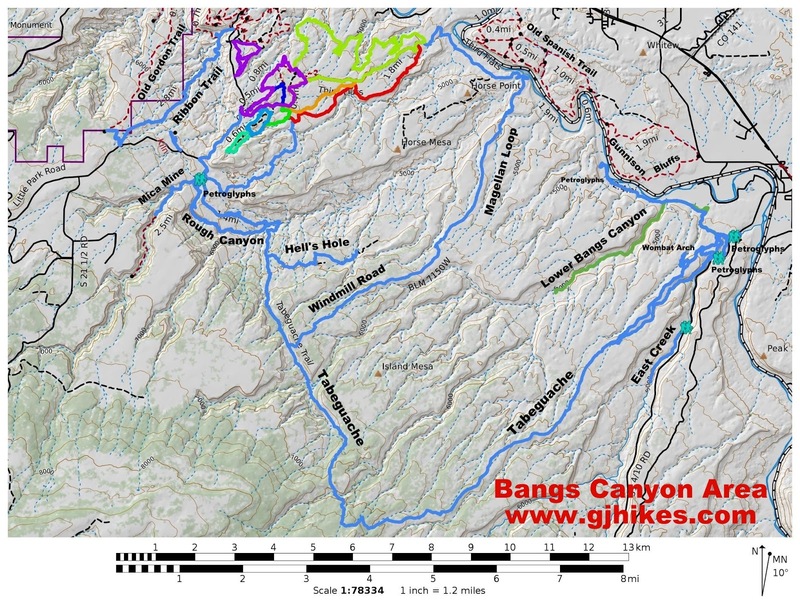 The Bangs Canyon area, with its interesting geology and rare biology, is a welcome playground for the naturalist hiker. It is a wild area close to a city with a moderate population where some of the less common varieties of nature can be easily observed. This post covers hiking down Rough Canyon to the falls and then returning to the trailhead via tha Tabeguache trail. Note: The middle section of Rough Canyon is very primitive and requires a lot of scrambling to get around boulders and rock falls. Beginning at the Bangs Canyon Staging Area the trails for Rough Canyon and the Mica Mine both start out by passing through the fence behind the kiosks. The trailhead is 700 feet higher than Rough Canyon Falls and is the highest point of the hike. There is some slightly difficult route finding and bouldering in the mid-section of the canyon. If you have small children you will probably find the first mile to be an easy and suitable hike. After descending a section of cliff, where an old road has been hewn through the rock, the Rough Canyon and Mica Mine trails go their separate ways. The Rough Canyon trail branches off to the south and continues dropping into the canyon to Ladder Creek. Once the trail reaches the seasonal stream bed of Ladder Creek it begins following it down and through the canyon. There are many pools where the creek cascades down falls from one to the other. There is a bit of a riparian environment of Cottonwood trees, Oaks and other bushes. I'm told that if you are sensitive to poison ivy you might want to watch what you brush up against. One of the higher waterfalls is where most hikers turn back. If this is as far as you venture then you can probably rate the hike from easy to slightly moderate. In a short distance you will have already experienced a spectacular environment that was well worth the effort. The upper rims of the canyon open up a bit at the top of this waterfall. The trail crosses a narrow ledge and descends downward along the wall of the canyon. Trail builders went through considerable effort to fashion this delightful section of trail. Precambrian era metamorphic rocks protrude from the floor of the canyon in places introducing themselves into the colluvial mix of Chinle, Wingate, Kayenta and Entrada sandstones that have come to rest after tumbling down the canyon from their original locations. The next section of the canyon becomes narrower and more difficult to navigate. The once obvious trail is now primitive and more allusive. Generally only the more hardy and experienced hikers venture beyond this point. For me, the crawling over and around boulders and between trees multiplied the fun factor. After multiple trips through Rough Canyon the best routes are discovered and the travel time is shortened considerably. A recent rockfall, where the canyon makes a bend to the east, had increased the difficulty for that section of trail considerably. I have hiked below the rocks, above the rocks along the canyon wall and right across the middle of the pile of rubble. After one trip through the middle of the pile of rubble I have decided to avoid it. The rocks are unstable and shift easily. It's not too hard to imagine yourself pinned or crushed amongst the boulders. The lowest route is fairly easy other than a few tree branches but the highest route is the one that I like best. Taking that route causes you to miss out on a few of the pools of water though. This is a picture of a rare Canyon Tree Frog that inhabits the desert southwest that was taken in the lower area of Rough Canyon. The last stretch of the canyon is mostly easy going. There are a few large boulders that are easy to overcome. The mouth of the canyon spills over Rough Canyon Falls. The signs at the trailhead might be a little misleading. If you drive down the 4-wheel drive road the distance to the falls is about 1.8 miles. 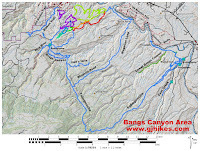 If you hike down the canyon the distance is about 2.6 miles. On todays hike it took me 2.5 hours to reach the falls. I had spent half an hour chatting with a fellow hiker and about that much time scouring the canyon walls for rock art. The above picture, that I took on my hike back up the canyon, shows another canyon that branches off too the left. If you have an extra 30 minutes or so it is worth the exploration. If you proceed carefully and quietly you might be able to spot an owl in one of the trees. And if you are quicker than me you might even be able to focus your camera in time to get a good picture. It only took me an hour and a half to hike back up the entire length of the canyon. It's not that often when the uphill section goes that much quicker than the downhill. If I was to ever come up with a suitable rating system for my hikes Rough Canyon would get a 4 out of 5 for a fun factor and a 4 for scenery. I would give the scenery a higher mark if it wasn't for the all of the modern day graffiti that has been lavished upon some of the canyon walls. I would have to give nature a solid 5 for the rare collection of plants and animals. Rough Canyon is definitely a great place to 'Take a hike'.